In this image from Friday afternoon, you can see the object at the eight o'clock position. The little white speck to its below-left is Jupiter, though quite a ways away. Wow. Da-da didn't want to write about this till he scoped the satellite views for himself. 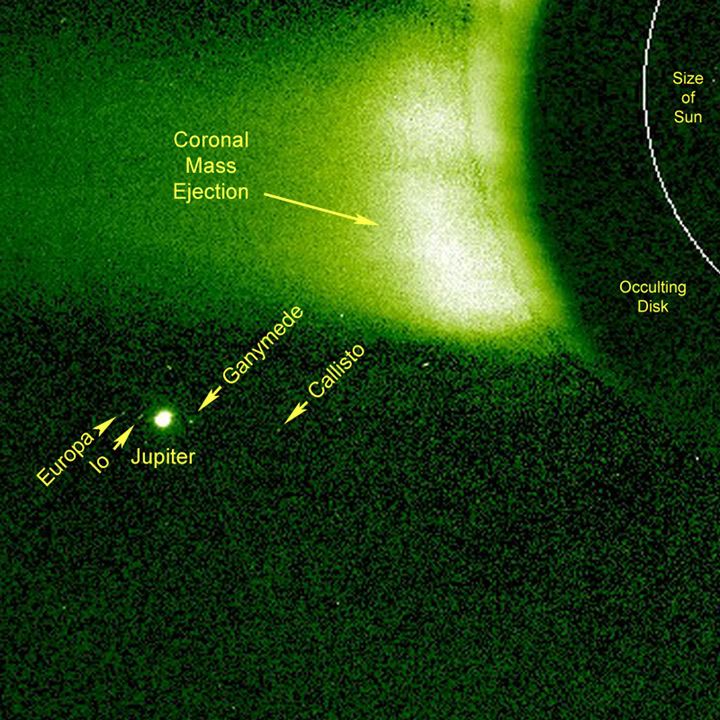 Whatever it is, it's there: an object the size of Jupiter -- bigger, actually, 10X bigger, if the image is accurate -- and two more may also have appeared, as well as a handful of objects larger than the earth. They can't be planets or, "companion stars," as the first one just suddenly appeared, as you'll see in the timecode images below. And glitches don't typically orbit stars. UPDATE: Click HERE for video of the object, "de-cloaking" -- or impacting the sensor -- whatever's happening here; anomaly pops up around the 6-17-13 date mark. 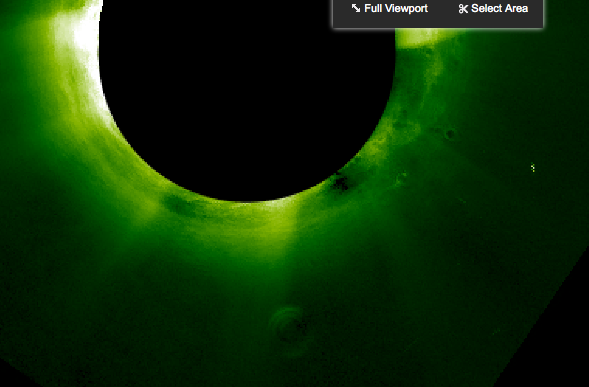 Video is of the sun over a week's timeframe via Da-da's custom data grab. Closer up in sat-mode. Note the sat. timecode and details, so you can find it for yourself on Helioviewer.org. ...the same thing from May 2012 (above). Note that two more enormous images are appearing at eleven and twelve o'clock. ...6/17/2013. 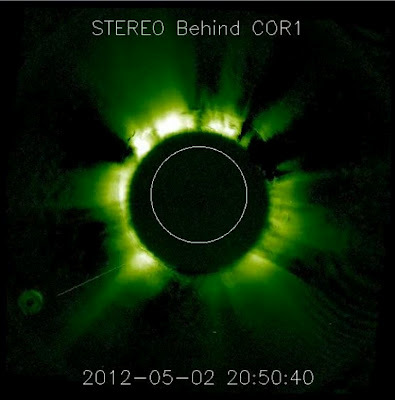 Go to Helioviewer.org and see for yourself... before NASA pulls the plug. 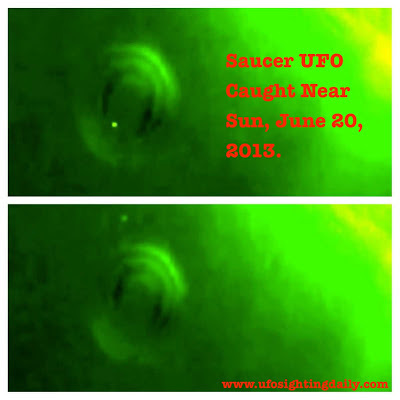 Here's a great close-up shot from UFO Sightings Daily. UPDATE: This anomaly has not moved since Da-da's original posting, which is a little suspect, bringing it closer to the realm of high-energy particle hit on the satellite sensor. Will update again if something interesting happens. no comments ? that's crazy ! Dad-da in its present green form it looks almost like a sigil for designer headphones but looking at it using my pc magnifier's colour inverter which turns it pink it looks far more like an old fashioned multi decked flying saucer. Also as you point out both the section facing the sun and the rear appears to be reflecting the sun too which'd be odd if this was a planet but if it's real hi-tech stuff then you'd actually expect it to shunt any excess radiation round the back as the quickest way to dispose of it much like these 'invisibility cloaks' apparently work by bending and sending light/time etc round and away from the object. Well, check out Da-da's latest UPDATE at the bottom of the page. The anomaly has not moved since Da-da pointed it out, which makes Da-da think it really might be a glitch -- unless the image is being intentionally frozen. I have made a shrine with a baseball in it, just in case they land here. Yup. Wilder still: the sun is a 3-D projector.